This is my first time making bitterballen, I think bitterballen commonly using ground beef but I use ground chicken and I added some diced carrots. Bitterballen is Dutch delicacy but very popular in Indonesia, it's similar to croquettes but different in shape and unlike croquettes bitterballen do not use potato. It's pretty simple to make, if you plan to have a party you can do all the preps day ahead and fry them on the D day. Heat the olive oil and saute garlic and onion until fragrant then add ground chicken, cook until the chicken is done. Add in some carrot and celery, keep stirring. Add salt, sugar, pepper and nutmeg. Pour in some milk and keep stirring until the milk is boiling, then add the flour in, keep stirring to make sure everything is well mixed together and no more liquid. Set aside and let it cool or put it in the fridge overnight. When it's cool the mixture is getting harden and is easy to shape, use ice cream scooper to help making all the balls uniform, but re-shape it again with your hands to make sure each ball is firm. This is important, you do not want extra oil absorbing into the balls during the frying process. Drop each ball into the breadcrumbs then to the egg wash mixture then back to the breadcrumbs again. Deep fry them until golden brown and crispy. Ready to serve with your favorite sauce, I love to enjoy it with honey mustard or chili sauce. I've been craving for this chinese style steamed bun a.k.a mantau for long a while, but never challenge my self to make it. And I was so glad to found out that our local Asian market carry the frozen plain mantau. So all I have to do is just to make some filling for stuffing then steam the bun. It's very easy to make and my boys are all love it!! Mixed all the fillings ingredient together until mixed. Slice the bun but not completely all the way, just like a hot dog bun. Steam it until done, and ready to serve with chili sauce. It would be great for brunch or you can pack it for lunch. I still have some leftovers of grated coconut from making PUTRI AYU the other day, and I do not like wasting :P so I decided to make some kelepon today for the boys to snack on after school. Kelepon is a traditional Indonesian snack made from glutenous rice flour filled with palm/arenga sugar, boil it, then rolled it into steamed grated coconut. It's really simple to make, I think almost every Indonesian know how. Normally if the recipe calls from pandan flavor, I always use instant pandan paste, but this time I have canned pandan extracts handy, so I use that instead. And I could not be more happier with the result! I love love love the final color. The green is more natural and I love it!! ..... it really reminds me of home!! 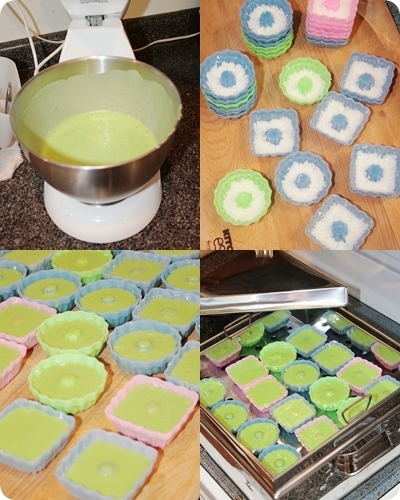 Next time I'll use canned pandan extracts if I can, since I know in some recipes you have to stick with pandan paste. In the mean time, heat the pandan extracts until warm (do not boil it), add 1/2 of salt and 1 tsp of lime stone paste. Mix it well, then add the glutinous rice flour into it. Use your hand mix it well and knead it until ready to be shaped. Take a small amount of dough, flatten it, then put a little of palm sugar in the center. Using your hand, shape the dough into like a small balls, about 2 cm of diameter. Then boil it in a hot boiling water until done, about 5 minutes. When it's done, roll the balls into prepared grated coconut. Putri Ayu means beautiful princes, some people also call it putu ayu. This sweet traditional Indonesian dish will always be my favorite. Back then when I was a kid I always loved when my mom took me to the traditional market, and she gave me some treats if I behaved, and putri ayu is the one I always picked along with carabikang (another Indonesian treats I haven't try to make my self yet). Mix together grated coconut milk, corn starch and sugar, then steam it until done for about 5 minutes, or you can put it in microwave and set on high for 1 minute covered. Prepare the molds and spray it with cooking oil such spam to avoid sticking, then put some prepared coconut about 1/3 or the mold or as you wish and pat it with finger tip. Mix together eggs and sugar and set the mixer in high speed, mix it until the egg becoming pale and the sugar is dissolved. Add in the coconut milk and pandan paste and mix it for a little while, then turn off the mixer. Mix together flour, salt and vanilla (I use the powder kind) and add it into the batter. Use spatula to stir and make sure there are no clumps in the batter. Pour the batter into the molds already has layer of prepared grated coconut. Steam it until done for about 15 minutes. This morning I was so nervous because the treats I made are very time consuming, I prepared as much as I can a night before, but everything need to be fresh, so I did my best to prepare what I can and do the rests in the morning. Inside the tray are mini spring rolls, kue lumpur and putri ayu. Will post the recipe of putri ayu soon. 25 gr dried shrimp, soak it in a hot water then grind (optional) --> I substitute it with 1/2 tsp of fish sauce. Heat 2 tbsp of cooking oil and saute garlic and onion until fragrant. Add ground chicken and dried shrimp, keep stirring to make sure the chicken is not clumpy. Pour in the chicken broth and the rest of seasonings. Let it boil then add the vermicelli, stir again. Lastly add the egg and make sure everything is well mixed and no more liquid. Remove from heat, set aside and let it cool. Prepare one sheet of the spring roll skin, spoon a small amount of filling mixture in the center then fold it like an envelope, seal the edges with egg white. Deep fry until golden brown, ready to serve with your favorite dipping sauce. KUE LUMPUR literary means mud cake, but don't get confuse or mixed up with American mud cake. It's totally different. Kue lumpur has a texture similar to pancake, tastes like in between pancake and custard with a hint of coconut flavor plus raisins. You can choose raisins for the topping, young coconut flesh or any of your favorite sweet toppings. * since I used 400 ml canned coconut milk, what I did was taking 100ml of the coconut milk and diluted it with 150 water. And I added 200ml of water and mixed it to the remaining 300ml so that would make 500ml. 1. Heat the margarine and 250 ml light coconut milk and sugar until margarine melted and boiled, add salt and vanilla. Then add shifted flour and quickly mix with wooden spatula until it gets really well mixed. 2. Turn the stove off and remove from the heat. Gradually add some egg and 500 ml coconut milk and keep stirring until well blended and the texture is smooth and silky. I strained the mixture using a very fine strainer to make sure there are no clumps. 3. Heat the pan on top of the stove and brush it off with some margarine to avoid sticking. Pour the mixture for about 3/4 of each cup, cover and let it cook halfway. Add some raisins then cover it again and cook it until done. 4. Using a small heat proof spatula gently remove kue lumpur from the pan and ready to serve, it's good with cup a tea for morning or early evening snack. Still about egg!! this time is Salted Egg. I made this long time ago but never had a chance to post it here. I often craving for salted egg especially when I made some Rawon (Indonesian style beef stew), but the salted egg I got from Asian grocery is so much different from Indonesian one, I do not like the taste and its texture, it's way way too salty for me. Commonly salted egg is made using duck egg, but since I do not have duck eggs here I used chicken egg instead. I raised some chicken at the back yard and I was so excited when I found out one of the chicken is giving me a light blue egg, just exactly the same color with duck egg's shell. To make salted egg, normally we use some kind a sand mixed with lots and lots of salt. Then we cover the egg and let it sit for days up to a week or so, after that then it can be harvested. The most commons way to cook it is to boil it, but I you can also mix it with nasi goreng or even some other dishes just to give an extra savory and salt flavors. Since I do not have and do not dare to use any available sands here, I use water instead. Actually I knew this technique from a good friend of mine, at first I was kind a reluctant to try, but I did it anyway. The result was so good and I honestly think the taste is so much better compared to the one I got from Asian Market. Mix the water with salt until dissolve, soak the eggs and make sure the water covers it. Use a small plate or any other object and put on top of the eggs so it can be covered by salted water. Put aside for up to 1 week (I some times do more than that). Do not worry the salt will protect the eggs from getting rotten. After 1 week try to boil one of the eggs, if you satisfied with the saltiness you can harvest it all, if you think it is not salted enough then let it sit in the salted water for another week until ready to be harvested. Marbled egg is called Pindang Telor by Indonesian, if I am not mistaken, I think this is one of the Chinese influenced dish enjoys by many Indonesian. The Chinese version however is quite different because they are using a completely different spice and herbs. The only similarity is its cooking technique. This kind of egg is very commons to cook on a special occasions or celebrations as a side dish. Back home my mom still making this if they have something to celebrate or we call it SYUKURAN (a special occasion of thanking God for all His Blessing by inviting people to enjoy some traditional dishes). And afterward they usually going home with a box of rice and so many side dishes, and this kind of egg is one of them. Traditionally to cook this egg you'd need lots of red onion's skins and guava leaves to add some unique colors. But since I am lack of the guava leaves I am using teabag instead, works great!! I enjoy this egg with some rice porridge or some Nasi Uduk (Indonesian Fragrant Rice). Boil the eggs with all of the other ingredients until the egg is cooked, turn the heat off, set aside and let it cool. Crack the egg shells but do not peel it, just enough so the juice can get trough and give its marbled pattern and color. Reboil for another hour or so until the colors turned much darker. Set aside and let it cool, ready to serve. I also put this egg in my son's bento, you can check it out here. BUCKLE is a tender yellow cake with a fruit and streusel topping. I adopted the recipe from the "Fine Cooking Annual" book. The original version is Apricot-Raspberry Buckle. But since I still have some strawberry left I better use it before it goes bad. I also use some diced apples that I sauted with some butter, fresh vanilla bean, cinnamon and sugar. Smells amazing!! When hubby came home yesterday I asked him to taste it, and he just could not stop ...he even skip dinner. Need I say more?? Recipe adopted from the Fine Cooking Anual, modified by ME. Position a rack in the lower third of the oven and heat the oven to 370F, butter a 9 inch square pan. In a medium bowl, combine the flour, sugar, cinnamon, and salt. Add the cold butter and cut it in with a pastry blender or two table knifes until the butter pieces resemble small peas. Refrigerated until needed. With a hand or electric mixer (use the paddle attachment) beat the butter on a medium speed until smooth, about 1 minute. Add 1/4 cup of sugar and the extracts. Beat for 1 minute. Gradually add the remaining 3/4 cup sugar while beating on medium speed. Stop and use a rubber spatula to scrape the bowl and batter. Beat on a medium high speed until pale and slightly fluffy (the sugar will not be dissolved), about 3 minutes. Reduce the speed to medium and add the eggs, one at a time, mixing it until the batter is smooth each time. Stop and scrape the bowl and the beater. On low speed, add the flour mixture and beat only until incorporated. The batter will be thick. Add half of the apples and half of the strawberries to the batter and fold them in gently with a large rubber spatula. Some of the strawberries will be break when baked, the pinkish cast will disappear. Spread the batter into the prepared pan and distribute the remaining fruit evenly on top. Sprinkle the streusel over the fruit. bake until the cake springs back in the center when lightly pressed and a toothpick comes out clean, about 45 to 50 minutes. Let the cake cool in its pan on a rack. Serve warm or at room temperature.